This year we decided to do something special for my sons Minion loving teacher for Christmas. My son was so excited about making these. He painted the snow himself. The only part I did myself was the eyes. I used paint for the whites of the eyes and a sharpie for the pupils and the glasses. I also wrote the year and his name on the back with a sharpie. 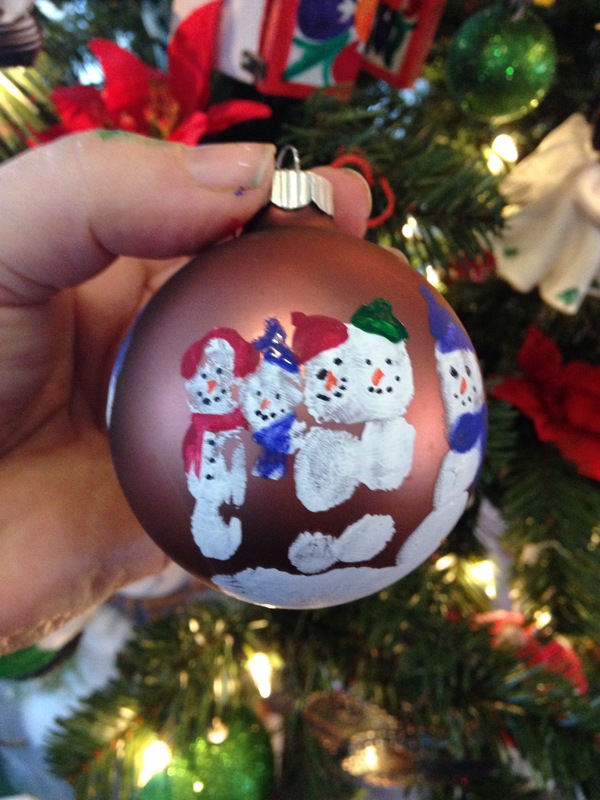 This turned out so cute I think I’m going to have all of my kids do one of these for our tree! I wanted to take a minute to show you what you can do when handprints go wrong. Here’s an ornament my four year old did for his preschool teacher. One of his fingers slid and he ended up with multiple impressions of the same finger but I just painted them up to blend in with the others and honestly I love it. To me it looks like a little snowman family mom, dad, & baby. I think little “mistakes” are sometimes what makes these kinds of gifts so precious.